After graduating with an Environmental Science degree in 2007, Aimee spent a few months volunteering on organic farms here in Manitoba and grew a love for green-housing. But a full summer of volunteering and it was time to buckle down and find that environmental 'career.' While searching for career leads, she noticed an ad by Prairie Habitats Inc. for a 'native plant greenhouse and nursery for sale' that tweaked her interest and something told her to follow up on it. Only a few months later Prairie Flora was created with a plant sale planned for the following spring! Only one big problem - we now had a 2000 square foot greenhouse and nowhere to put it. We spent the next few months inquiring with several farmers and finally connected with a great couple willing to help us out. 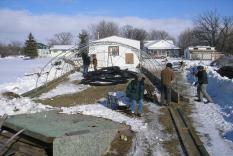 Greenhouse construction began in February of 2008. Yes, we said February! To our surprise, a handful of our friends and family were crazy enough to help us construct a greenhouse in -30 degrees Celsius, just 2 weeks before our plants moved in. And as our plants grew, so too did our new found passion for the prairies. We would like to thank all customers who stuck around through the change in ownership. We look forward to establishing lasting relationships with them and creating new ones. Our New Prairie Flora Farm! Due to requirements for more greenhouse space and a longing to find our own little piece of the prairie, we recently bought a property just north of Teulon, MB. (30min north of Wpg.) and have found it to be a delightfully friendly place to be. Despite the move, we will continue our sales at the Living Prairie Museum and are now coming up with more ways to be accessible to those people in and outside of Winnipeg. Our new home includes 8 acres of trees and open area. We love our forest and will leave most of it just the way it is however; we are also looking forward to turning some of this overgrown prairie back into native wildflowers and grasses. We are looking forward to planting more of our own stock so we can spend more time searching out new species to offer you in the years to come. We have also recently expanded our business to include Heirloom Vegetables, Herbs and Cottage Garden Annuals.